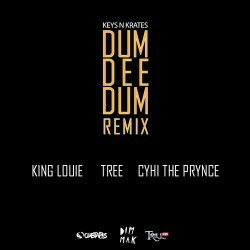 Not more than a few days since the release of their official music video for "Dum Dee Dum", Keys N Krates is back with a remix of the track featuring King Louie, Tree, and Cyhi the Prince. The track utilizes three killer verses from the guest appearances, as well as a choppier edit of the original beat. Each feature goes hard, with aggressive, angry lyrics to help boost the adrenaline in this edit. With the help of Livemixtapes/Clubtapes and Dim Mak, KNK has placed yet another work atop of Hypem, generating a buzz over "Dum Dee Dum" that's hard to miss. Can we expect more remixes of KNK's original works? No one can be sure at this point, but we can almost guarantee the group is showing no signs of stopping anytime soon, with the SOLOW EP still in circulation and the tour in November. See dates below, and grab the download of the "Dum Dee Dum" remix now.